Remember when I sported this Roksanda Ilincic dress last summer? 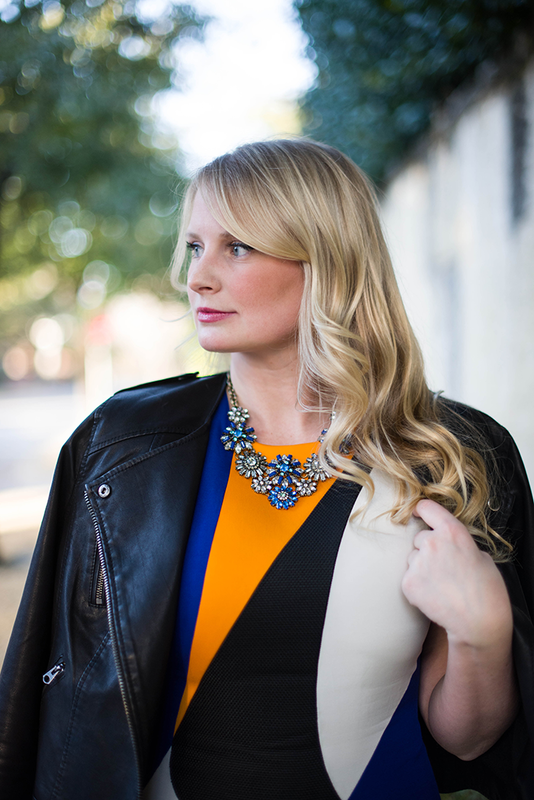 Not only is it a great sleeveless frock for the warmer months, but this colorful dress is a gorgeous statement piece for winter too. Did I mention it’s on sale at THE OUTNET now? A win-win and an unexpected season-less favorite. I just threw on my faux-leather jacket from Topshop and some shiny new Wolford tights to warm up the ensemble. 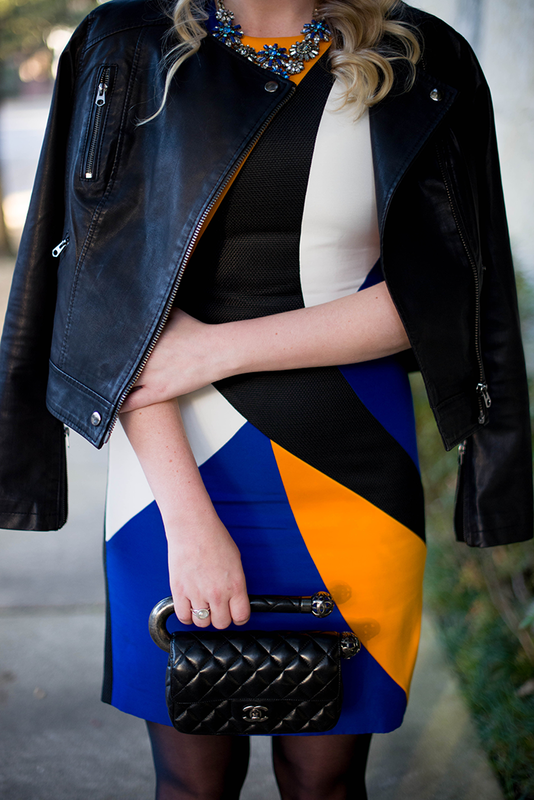 The graphic colorblock on the dress works well with my Nicholas Kirkwood pumps, right? It also picks up the colorful jewels in my newest BaubleBar piece, this crystal necklace (only $52). Gotta love a good steal! That dress is amazing and really can be worn all year long, love all the little details added to it. Great investment piece. Love mixing of the prints! Such a fun look! I love the jacket and that necklace. Perfect accessorizing. That bag is so amazing – love the unique shape! I’ve never seen a Chanel like yours! So unique and cool! Love how you transitioned this bold dress, and those pumps…amazing! That bag, amazing! I love bold patterns to enliven winter clothes. Your bag is so amazing!! And I love how you combined the shoes with the dress. Bold indeed! It works beautifully! Those shoes are amazing! The bold look is great! Gorgeous fun prints!! It feels very mod in a contemporary way! Those shoes are fantastic! Super cute =) Keep up the great work on the blog, Merritt. It (and more importantly, YOU) are looking fabulous!! The dress is bold and I like it. Nice Chanel too. This dress is stunning! I like how you combined different patterns, yet it still looks well put together. Everything about this outfit! Totally swooning over here! The shoes and dress are to die for! 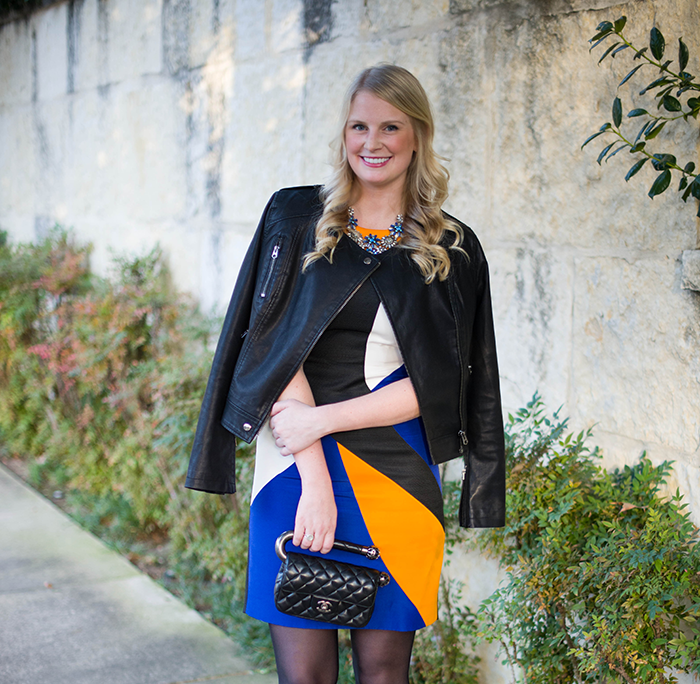 I am loving that color blocked print! I’m so obsessed with your shoes, girl! You look amazing!! :) Absolutely gorgeous, as always. The detailing on this outfit is just astonishing. The color blocking on the dress and the pattern on the shoes are amazing. Mixing prints is one of my favorite trends right now – great look – I especially love the heels! I love how pretty that skirt is, you look gorg! Those shoes!!!! LOVE LOVE LOVE! Gorgeous dress from head to toe you styled it perfectly!!!! Love love it! Oh gosh! I’m in love with that leather jacket! Gorgeous! I love the print of the dress mixed with the pumps! The pairing of these graphic prints is genius. Over the past 2 years, I’ve watched as your style has evolved to include much more color and edginess. At the risk of sounding corny, you’re a source of inspiration.